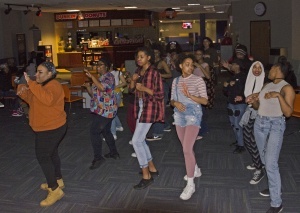 Students donning ’90s attire such as ripped jeans, headbands and bandanas celebrated the end of Black History Month at the Black Student Union’s second annual ’90s themed dance party on Friday. Jaylin Archie, chair of the BSU, said the union fundraises throughout Black History Month. Archie said the party was for all YSU students to come together and have fun. He said the ’90s theme was chosen because it was a decade that many Millennials relate to and remember fondly. He said the theme was a “common medium” for students and he said he hopes something like the party could help to spark new relationships. Archie pointed out the importance of having an opportunity to connect people from different backgrounds. “It is my duty as a student organization leader to provide inclusive events for students,” he said. “No single race has done anything on their own,” he said. “The Black Student Union is here to serve everyone by spreading diversity, embracing diversity, but more importantly, we are here to advance African-Americans on campus,” Archie said. Sylvia Arias, sophomore childhood education major, said she loves to dance and felt comfortable dancing at the party. “[Dancing] is a way to express yourself through music,” she said. She also said that there was a lot of diversity at the party. Serina Pipkin, sophomore nursing major, came to the party wearing a bandana. She said she likes to dance and every person dances differently. “I don’t discriminate,” she said. “Everyone has a different form of dancing … and I have my different form of dancing,” she said. Tipkin said that there few opportunities for minority students to express themselves. “[This event] will just bring us together,” she said. She said her birthday was in February and she was born in the ’90s, so the evening was like a birthday party for her.